The 2016-2017 season was a rollercoaster ride for the Buccaneers’ fans. The season kicked off with a change in the team’s front office and ended with a nail-biting win against the Carolina Panthers. Despite obvious ups and downs, the Buccaneers finished that season with a division win, their first winning season in six years. This most recent season, the Buccaneers failed to improve from 2016 and finished the regular season 5-11. Now the Buccaneers are on a 10 season streak for not making the playoffs, the last time being in 2007. This season, the Buccaneers are locked and loaded and ready to make an impact on the NFC playoff picture. With a young and hungry roster, Tampa Bay has their sights set on claiming the NFC South and bringing home another Super Bowl trophy. Aside from battling with cross-state rivals the Miami Dolphins and the Jacksonville Jaguars for bragging rights, Tampa Bay will have to defeat division rivals, the New Orleans Saints and the Atlanta Falcons, who seek to halt their aspirations. Get your Tampa Bay Buccaneers tickets and head over to Raymond James Stadium to help lead your team to victory. First NFL Win 1977 – On December 11, 1977, the Bucs earned their first NFL victory after defeating the New Orleans Saints in their hometown, the Louisiana Superdome. The Buccaneers turned three interceptions into touchdowns and tied an NFL record. They won the game 33-14 to the roar of 8000 fans in the stadium. Super Bowl 2003 – The Bucs’ defense went head-to-head with the top-ranking defense of that year’s NFL— the Oakland Raiders. Tampa won their first and only Super Bowl 48-21 and set a Super Bowl record of five interceptions. On January 26, 2003, in front of 67,603 fans at the Qualcomm Stadium in San Diego, California, CB Dwight Smith turned two interceptions into touchdowns. This was a key factor in the Buccaneer’s victory. First Hall of Fame Induction 1995 – Lee Roy Selmon, the Buccaneers’ former defensive end and first draft pick, became the franchise’s first ever player to be inducted into the Pro football Hall of Fame. The ceremony took place in Canton, Ohio. Florida Panthers – The two teams first faced off in 1995 and then moved to the NFC South Division. Since then, the two teams have met during playoffs. Panthers/Buccaneers games are known for being extremely physical with many players getting seriously injured on both sides. Kavika Pittman’s career-ending injury to the knee and Chris Simms’ ruptured spleen are just some of the examples of injuries contracted in their games. New Orleans Saints – The Tampa Bay Buccaneers and the New Orleans Saints met in 1977 for the first time. Despite being in different divisions at the time, the Saints and Buccaneers had regular pre-season games against one another. The Saints have particularly given Tampa a hard time in the 2017-2018 season. Let’s see if Tampa can regain their lead in the 2018 NFL season. Cadillac Williams is one of the top running backs in Tampa Bay’s history. His aggressive playing style on the field is what has kept his memory alive in Bucs fans today. 2005-2010 Williams maintained a rushing record and retired from the team as the fourth in Tampa history in rushing yardage. Jimmie Giles (1978-1986) is considered one of the greatest catchers in Bucs’ history. A fan-favorite, Giles tops Tampa’s franchise record in receiving yards and receptions. During his tenure, he helped the Buccaneers become one of the strongest defensive sides in the NFL. He was selected four times for the Pro Bowl following in the footsteps of the mighty Lee Roy Selmon and John McKay. Raymond James Stadium offers a one of a kind experience game-day experience for all Buccaneer fans. The stadium hosts a 103-foot, 43–ton steel-and-concrete replica pirate ship, which fires soft-rubber footballs and confetti each time that the Buccaneers score points or enter the other team's red zone. An animatronic parrot sits on the stern of the pirate ship and frequently talks to passing fans during games. The Tampa Bay Buccaneers are all set to welcome both teams and fans to the Raymond James Stadium this season. If you want to see how the Bucs will perform this season, get your Tampa Bay Buccaneers tickets 2018 from here now. Our process for purchasing cheap Tampa Bay Buccaneers tickets is simple and fast. There are so many online ticketing sites, that it can be hard for customers to find the right place to buy Tampa Bay Buccaneers tickets at the cheapest price. At ScoreBig we think of our customers first and foremost. We offer daily deals for Tampa Bay Buccaneers events, so our customers can get the best seats for the best prices. ScoreBig will always go above and beyond to offer the cheapest Tampa Bay Buccaneers tickets on the market. The Tampa Bay Buccaneers schedule above, displays all available events for 2019 and 2020. Once you find the event that you would like to go to, click the red “Get Tickets” button. It is located on the right-hand side of the event listing, it will take you to an Tampa Bay Buccaneers event ticket page. ScoreBig's event ticket page will display all available Tampa Bay Buccaneers tickets for that event. On the event ticket page to help with your search for the right Tampa Bay Buccaneers tickets, use the filters at the top to select quantity, price range, and more. There is also an interactive seating chart so you can pick where you want to sit. When you are ready to buy a ticket, click on the listing, and you will be directed to ScoreBig's checkout page. Upon completion of the information fields, your order will be processed and your Tampa Bay Buccaneers tickets will be delivered via email, mail, or to your mobile device. What makes ScoreBig’s site stand out from the rest? We are constantly analyzing our competitors to improve our site, service, and prices. ScoreBig.com employees strive to offer the best process and experience to buy cheap Tampa Bay Buccaneers tickets. Our goal is to get you the best seats to Tampa Bay Buccaneers events. We offer daily discounts on our site and for special promotions check out our newsletter. If there are no Tampa Bay Buccaneers events currently available, you can use our search feature at the top of the page to see a list of all popular events going on near you. No matter your price point, we have all the best deals and discounts on Tampa Bay Buccaneers tickets. For more information on prices of Tampa Bay Buccaneers tickets and the schedule for Tampa Bay Buccaneers, check out our listings above. The last thing you want to find out is when the Tampa Bay Buccaneers event you wanted to go to is sold-out. Don’t worry in many cases ScoreBig has affordable tickets to sold out events. We sell tickets from GA all the way to premium seating and parking. Skip the scalpers in the parking lot and get your tickets online from top Tampa Bay Buccaneers ticket brokers. We get you in all events, buy your Tampa Bay Buccaneers tickets here from a brand that many trust and rely on for all their ticketing needs. ScoreBig offers a 100% money-back guarantee. If you have been in search of cheap tickets for Tampa Bay Buccaneers, ScoreBig by far is the best option. That’s why ScoreBig has more loyal customers than any other ticketing site. 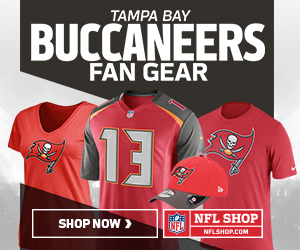 Shop at ScoreBig for safe and secure Tampa Bay Buccaneers event tickets.